Transgenics is an international journal dedicated to original reports of biological analysis through DNA transfer in vivo and in vitro. 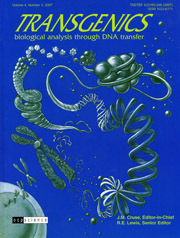 Transgenics not only covers information related to animal models of disease, but also the use of gene transfer in tumor research; developmental biology; immunology, including immunologic tolerance; transplantation, including HLA transfectants; reproductive endocrinology; and gene therapy among other specialties. The transfer of genes for research as well as therapeutic purposes is only in its infancy and requires a special publication for the free interchange of ideas and information. Transgenics is that publication presenting the latest developments in transgenic research to investigators engaged in bench work as well as to those in related disciplines who wish to keep abreast of the field. The journal offers an opportunity for the exchange of information between investigators using transgenic animals and those involved in transfection research in vitro. This communication between in vivo and in vitro researchers permits multiple disciplines to interact and achieve a cross-fertilization of ideas that facilitate biological analysis. The editors of Transgenics invite your contributions.